Mark Fox/TheAspen TimesSen. Hillary Rodham Clinton, D-N.Y., took the lectern at Harris Concert HallSunday morning. In the meantime, she said, “We are living in an exciting, even unprecedented era for discovery.”Warming to the topic, Clinton told the audience, “Some nation is going to catch the wave just right and ride it into security and preeminence.”The question, she continued, is whether that nation will be the UnitedStates or another. She noted that America has been on the crest of pre-vious waves of progress, from the Industrial Revolution of the 19th century to the explosion of personal computers and creation of the Internet in the 20th century.But the pace of change is accelerating, she said, and there is no telling what the “steam engine and the computer chip of this century will be.”One example of the next wave, Clinton said, is nanotechnology, the science of miniaturizing computers to the point where they are scarcely larger than a single cell. 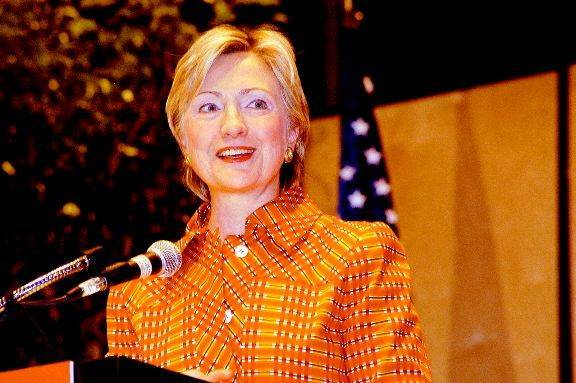 Clinton said she has been a sponsor of legislation supporting such research, but pointed out that other nations also are working along similar lines.An example of breakthroughs in artificial intelligence, she said, is ongoing research to develop silicon retinas – implants that could allow blind people to see or give the gift of sight to a robot. And, she said, the International Space Station is to soon be run by a voice activated computer named “Clarissa,” much like “Hal” the computer in the seminal science fiction film “2001: A Space Odyssey.”While scientific understanding and inquiry are on the rise elsewhere, “There are tremendously powerful forces working to undermine science in the U.S. today.” That was likely a reference to the work of the religious right to inject greater levels of faith-based thinking into the nation’s policy-making bodies. She called for a much more focused commitment to developing alternative energy sources as a way to vastly reduce or end reliance on foreign oil.”Ours will be the last generation to rely so exclusively on fossil fuels,” Clinton predicted, saying that the “ups and downs of the global oil market cost the U.S. economy $7 trillion last year … almost enough to pay off our entire national debt.”Clinton said she has worked to insert provisions into the ongoing Senate energy bill process, calling for increased reliance on such alternative energy sources as wind and solar. But she said the House of Representatives and the White House both have threatened to veto the energy bill because of the alternative energy provisions.She was critical of the Central American Free Trade Agreement, which is being sought by the Bush administration. It is intended to enrich corporations without providing adequate safeguards against unintended negative effects, she said. She maintained that trade agreements to open up the flow of goods and service throughout the Western Hemisphere are a worthy goal, but they must be coupled with protections for American jobs, the environment and worker safety in the rest of the hemisphere.Clinton did not mention the presidential election of 2008, but she did make several critical, even derogatory, remarks directed at President Bush.”I sometimes feel that Alfred E. Newman is in charge in Washington,” she joked, getting a warm laugh as she described President Bush’s attitude toward the tough issues of the day as, “What, me worry?”She accused Bush of undermining the national economy with deficit spending and huge tax cuts for the wealthy; endangering U.S. soldiers by not giving them the proper equipment to fight the war in Iraq; and harming the nation’s historic role as a leader in scientific research and technological innovation by slashing funding for such efforts.”There has not yet been one net job created in the last four years,” she continued, arguing that the Bush administration has concentrated on helping the wealthy at the expense of the middle class.That middle class, she said, is now threatened by the ailing economy, which is suffering from everything from a burgeoning national debt (she called America the “largest debtor nation the world has ever known”), to the loss of manufacturing diversity, rising health care costs, loss of pensions in many sectors and other causes.